We moved in last weekend and are back in Marrickville. It's been a long slog and there's still a bunch more work to be done before we're completely finished, but it's looking good. Awnings and privacy screens on. 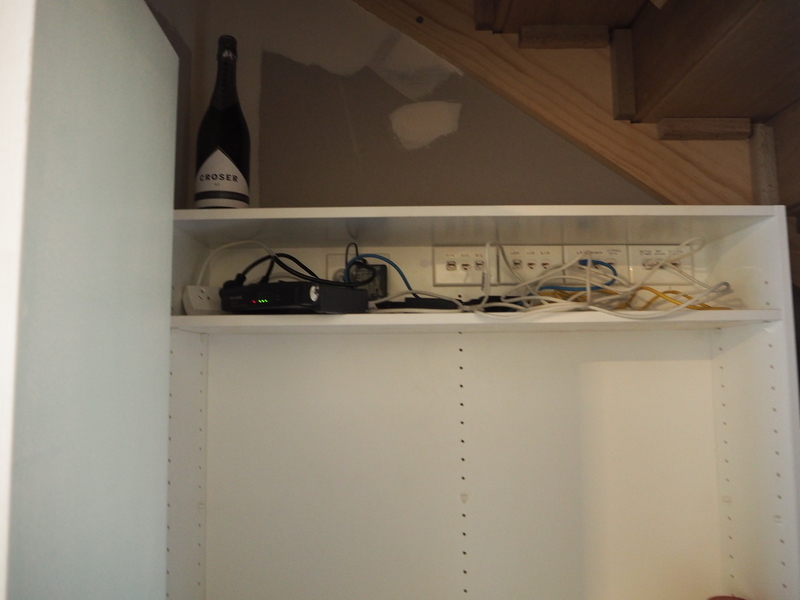 Networking set up and we now have access points throughout the house (using the amazing Unifi APs). The beautiful piece of bespoke joinery we had made for the kitchen was installed and looks fantastic. Now we just have to set everything up. Still some painting to be done and a few odds and ends. Huge amounts going on in the house. We move in on Saturday which is enormously exciting. Yesterday Holly managed to score a bunch of turf for free on Facebook, so this morning I was back at the house digging up the soil and laying turf. It looks good and cost nothing, which is nice. We're moving in next weekend. It feels like it's been a very long time, though realistically it's been pretty quick. Yesterday we dropped in to check out progress. Rooms getting painted, bulkheads installed in the kitchen, renders applied and the slate roof is being replaced. Popped in this morning to check on progress. 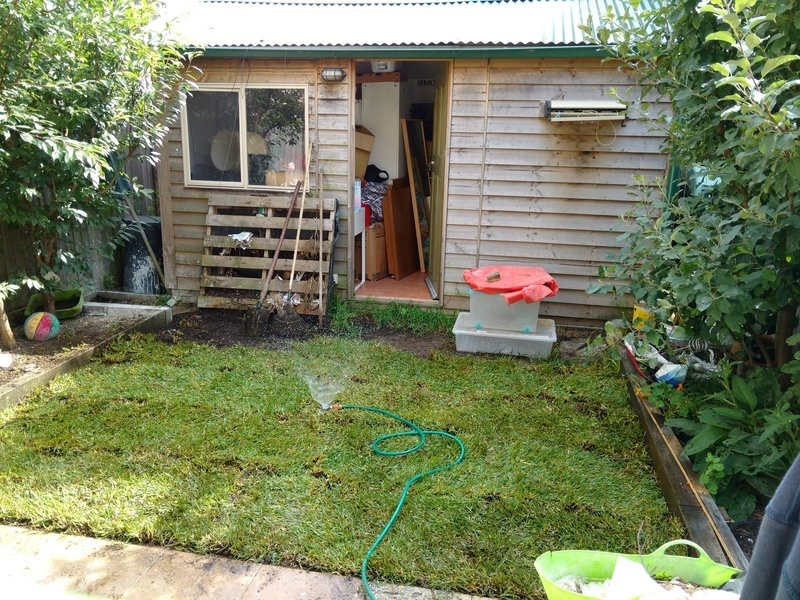 There were about 8 tradies on site putting in finishing touches. Painting, plumbing and carpentry all going on. All happening to allow us to move in the weekend after next. Very very exciting! Details are looking pretty awesome. The render and lime wash on the outside hempcrete looks amazing. Look at the bevelled edge on the corner in the photos below. Window reveals have been oiled and look stunning. We have a move in date! Big milestone reached this week. We got the builder to agree to a move in date. Everything should be finished enough for us to move in by 14th November. There might be some stuff still going on but all the big stuff should be done. Pretty exciting! This week saw the benchtop, sink, oven and stove arrive and get installed in the kitchen. Plastering and rendering is going on and some fans got installed upstairs. Popped in on Saturday to check the place out. Rendering of the hempcrete is underway. Plastering the internal walls is ongoing. The stairs are complete and look fantastic. Bathrooms getting waterproofed. The exterior cladding to the first floor is complete and looks fab! Recycled blackbutt timber. We're going to let it weather to grey. Inside the first layer of render is going on hempcrete, plastering is happening on internal walls and bathrooms are getting waterproofed. Appliances have started arriving: stove, microwave, fans all there, oven and sinks still to come. Things are moving along pretty quickly. Popped in on Saturday to have a look. The exterior cladding looks sensational. Really happy with how that looks. Kitchen is going in and looks vibrant. Appliances arrive this week and next it seems. Plastering is continuing. Feel like we're getting towards the end. In the photos you can see the massive pantry we'll be getting. The keen eyed will notice the ethernet that'll be going into a patch panel. I've been taking photos from pretty much the same position throughout the build, so I thought I'd string them together in a dodgy animation. Popped in this morning on the way to school dropoff to look into progress. It's looking incredible. Kitchen is going in downstairs. Plastering happening everywhere. Exterior cladding going on the outside back wall. Very exciting!